leakproof; frequent replacement and high maintenance are over! The absorbed glass mat (AGM) technology increases power while improving rider and environmental safety. The key to this technology is the highly porous microfiber separators which completely absorb and trap the electrolyte. Molded top and side connection terminals provide versatility, increased strength and durability. 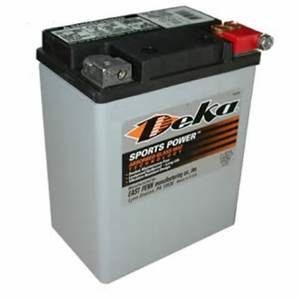 The Deka Sports Power AGM Battery provides the most advanced power and value in the industry, so your customers can enjoy their leisure time, worry free.